The Holy Father today received in audience Archbishop Gerhard Ludwig Mueller, Prefect of the Congregation for the Doctrine of the Faith. 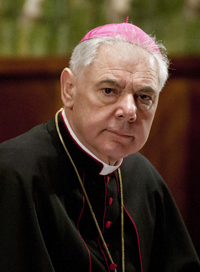 During the audience, various subjects pertaining to the Dicastery were discussed, the Holy Father recommended in particular that the Congregation, continue the line desired by Benedict XVI of decisive action regarding cases of sexual abuse, primarily by promoting measures for child protection; help for the many who in the past have suffered such violence; due process against those who are guilty; the commitment of Bishops’ Conferences in the formulation and implementation of the necessary directives in this area which is of great importance to the witness of the Church and its credibility. The Holy Father assured that the victims of abuse and their suffering are especially present in his thoughts and prayers.